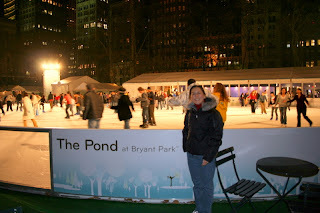 An outdoor ice skating ring at Bryant Park. Bryant Park is Midtown's only major green space. America's first World's Fair, the Crystal Palace Exhibition, was held here in 1853-1854. 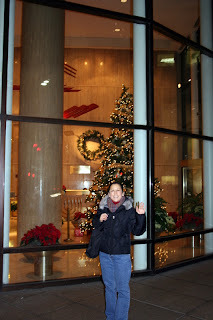 My employer gave me the opportunity to go to New York City for a week. 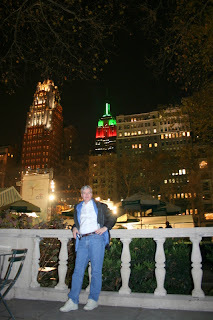 My wife Catherine took vacation from her job to join me and we left on a Saturday so we could enjoy the city. 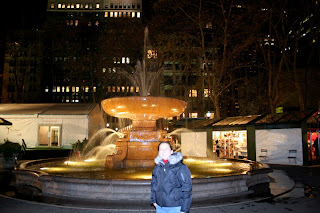 My wife recognized this fountain as the one shown on the TV series "Friends". I don't remember ever seeing the show, but later when we were at home, we watched to see if we could see the fountain and we did. 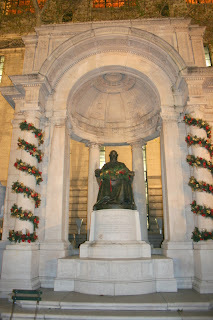 Josephine Shaw Lowell is the first woman to be honored by a major monument in New York City, was the first female member of the New York State Board of Charities, serving from 1876 to 1889. 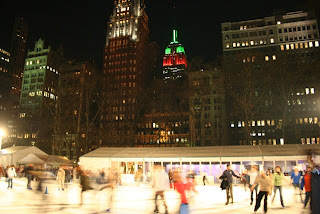 A scene from Bryant Park with the Empire State Building decorated for Christmas in the background. Bryant worked as a lawyer in Northampton, Plainfield, and Great Barrington until 1825 when he married and moved to New York City and worked for the New York Review and then the New York Evening Post. At first an associate editor, he became editor in 1829 and remained in that post until his death. As the driving force of this liberal and literate paper, he was strongly anti-slavery. Bryant was a lifelong political activist, initially as a proponent of the Free Soil Party, and later in life as a founder of the Republican Party. He was a fervent supporter of Abraham Lincoln's presidential bid in 1860. Bryant died in 1878 of complications from an accidental fall. In 1884, New York City's Reservoir Square, at the intersection of 42nd Street and Sixth Avenue, was renamed Bryant Park in his honor. 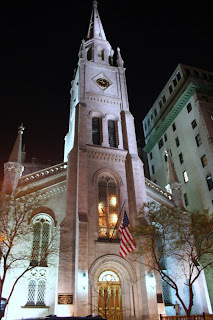 The Dutch Reformed Church was organized among settlers from Holland in New York City in 1628. In 1664, the colony passed from Dutch into English hands with an approximate membership of 10,000. They were all situated in New York and neighboring states. By the terms of surrender the Dutch were granted "the liberty of their consciences in divine worship and in church discipline". 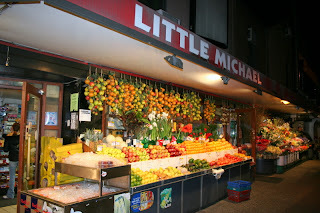 This is the little corner store near our hotel where we went to pick up fruit and snacks during our stay in New York City. 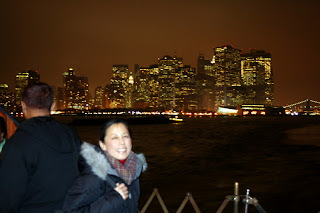 One night we took the Staten Island Ferry from Manhattan to Staten Island just to see the skyline of New York city. There is no charge to take the ferry, so it made for a nice an inexpensive treat. 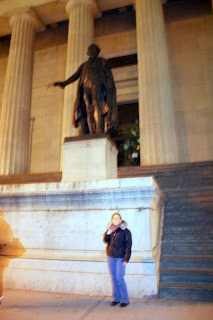 When we left the Staten Island Ferry, we walked through the Wall Street area headed to Greenwich Village. On the balcony of the Senate Chamber at Federal Hall on Wall Street. General Washington was unanimously elected President by the first Electoral College, and John Adams was elected Vice President because he received the second greatest number of votes. The new President gave his inaugural address before a joint session of the two Houses of Congress assembled inside the Senate Chamber. Sculptor Arturo Di Modica, who created the famous flared-nostril, 7,000-pound bull that sits in the heart of New York's financial district in lower Manhattan. 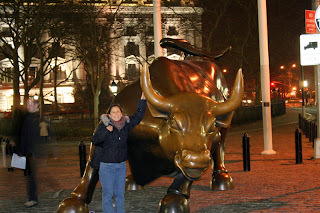 The bronze sculpture is one the world's best-known symbols of American capitalism and one of the biggest tourist draws in the financial district. 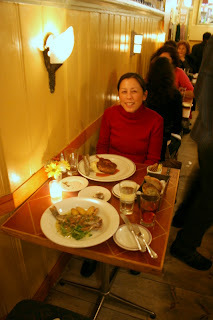 Using Frommer's New York City for Dummies book, we found some great restaurants, including this tiny place in Greenwich Village simply called Home. Catherine had a signature pork chop served on a bed of homemade barbecue sauce and I had a filleted-at-your-table brook trout. Both were excellent dishes. Greenwich Village was once a rural hamlet, entirely separate from New York, its street layout does not coincide with most of Manhattan's more formal grid plan. This has resulted in a neighborhood whose streets are dramatically different in layout from the ordered structure of other parts of town. Many of the neighborhood's streets are narrow and some curve at odd angles. Unlike most of Manhattan, streets in the Village typically are named rather than numbered. It was fun for us to just walk around the Village. 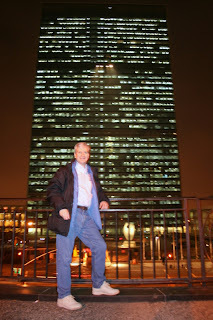 It is sometimes incorrectly stated that the famous "beat their swords into plowshares" passage from the Book of Isaiah (Isaiah 2:4) is inscribed on a wall at the U.N. headquarters building. 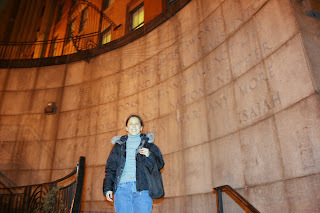 In fact, the inscribed Isaiah Wall is in Ralph Bunche Park, a New York City municipal park across the street from the U.N.
For more photos of New York, please check out my previous post: New York City, New York – Part III. 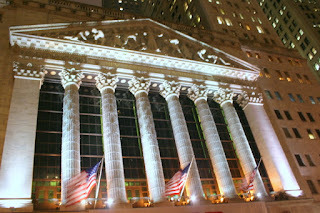 For more information on our trip please check out: New York City, New York V.
Glad to see you back posting and commenting! Great shots from the Big Apple! 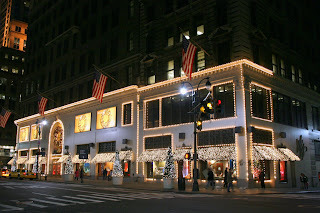 You know that NYC is one of my favourites, and I think I've been there more than 60 (sixty) times... but don't think I took many pictures during Christmas time. 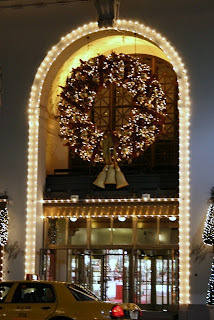 Last time I was there at this time of the year was in 96/97 and have some pics at Blogtrotter Revival 90s! 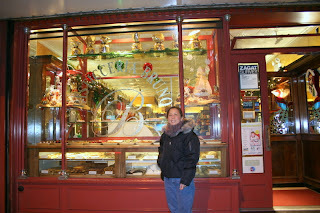 Merry Christmas to you and Catherine!